In South Carolina, all adults have the right to make decisions about their own healthcare. If there are certain treatments you would not like to receive or a person you’d like to appoint as a healthcare representative, you have the right to do so, and healthcare providers must respect your choices. 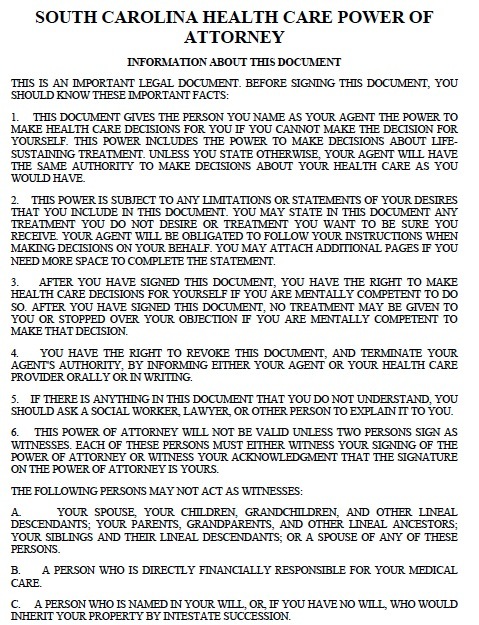 A health care power of attorney enables your representative to make almost any healthcare decision you would be able to make. These include consenting to or refusing any type of treatment or medication to reduce pain regardless of its potential for addiction, admitting or dismissing you from healthcare facilities, and taking any other necessary measures to follow your healthcare instructions and interests. These are sweeping powers, so you should take care in choosing a representative and consider limiting which powers to grant. Also, you should make sure your representative is familiar with your values. A living will, also called a “Declaration for Desire of Natural Death” in South Carolina, allows you to provide instructions for your treatment in end-of-life circumstances. This means you can choose to withhold life-sustaining treatment if you have a terminal illness or are permanently unconscious. To qualify, a terminal illness must be incurable, irreversible, and doctors must determine that the illness would cause the patient’s death if life-sustaining treatments ceased. These can be difficult issues to think about, but planning for these issues could save your loved ones some grief and stop you from enduring an illness unnecessarily.